I’m slowly catching up on everything that got pushed to one side during our recent hospital dramas but I’m really lacking in motivation if I’m honest. 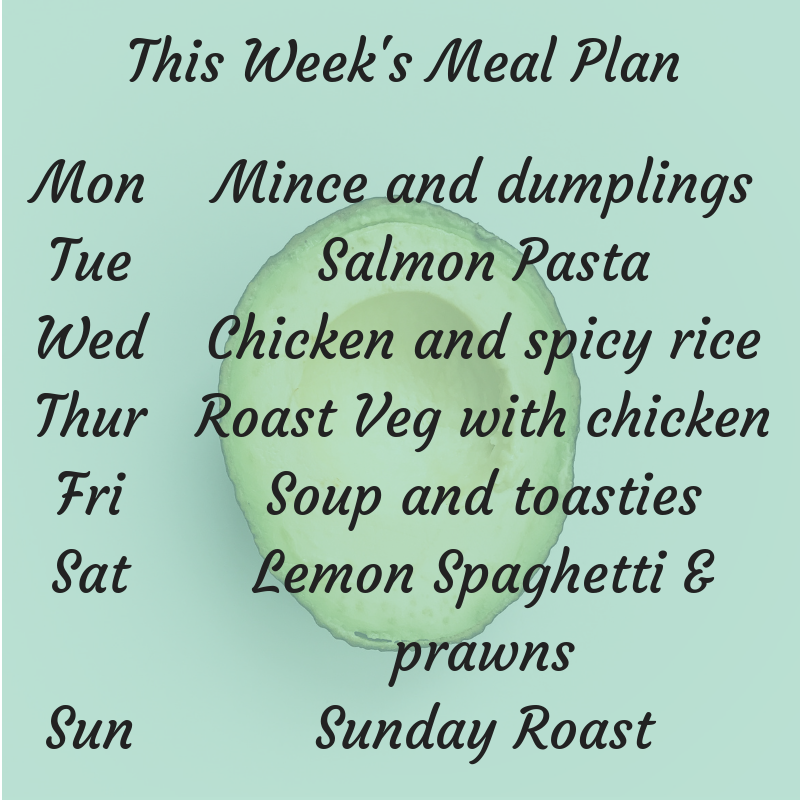 I’m determined to shake it off though so my meal plan this week involves a bit more work from me than usual – my thinking is that if I force myself to do more then it might jump start my motivation! I’m out late on Monday so it’s going to be a slow cooker tea day and mince and dumplings is one of our favourites! I found a few salmon fillets at the back of the bottom freezer drawer so I’m going to attempt some sort of salmon pasta bake. Our veg box will be here on Thursday morning so we’ll be having roasted veggies with some chicken breast that we still have left from our last Muscle Food order. I need to get my freezer emptied a bit before I can do another order though so I think these are the last ones we have. This is fast becoming one of our favourite teas! Toasties are always of our favourite comfort food easy meals and today we’ll be having them with some soup made from our veg box delivery. After last weeks lemon risotto, I thought I’d try some lemon spaghetti and add the prawns that I found hiding away with the salmon! Don’t miss out on future posts like this – receive updates directly to your inbox by email by adding your email address to the box on the top right of this page and hitting subscribe. You can also follow me on BlogLovin and I’d love to see you over on my Facebook page, or in our Facebook Group or even over at Yummly or on Instagram.